"A semicolon represents a sentence the author could have ended, but chose not to. The sentence is your life and the author is you." I am love with this new necklace! The semi-colon is representative of the work being done by Project Semicolon Inc. and the wings are for renewal, hope, positive change and growth. 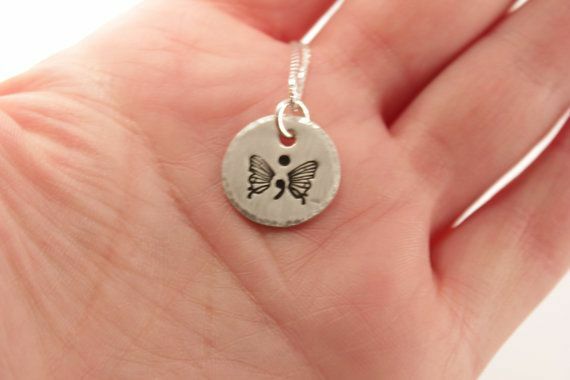 •	ONE small 5/8" (a little smaller than a dime) sterling silver disc is hand stamped with a semi-colon flanked by two butterfly wings. •	Your choice of a 16 or 18 inch sterling silver box chain. •	Rush processing and expedited shipping can be added at checkout. •	The item will be shipped ready to give, tucked inside a drawstring bag. •	Whenever possible, we source our supplies from other small businesses and recycle / reuse packaging materials to help reduce our environmental impact. We responsibly recycle all waste/scrap metal. Every maker has a story. Be a part of Completely Hammered's story by placing an order, leaving a review, and seeing your review appear here.